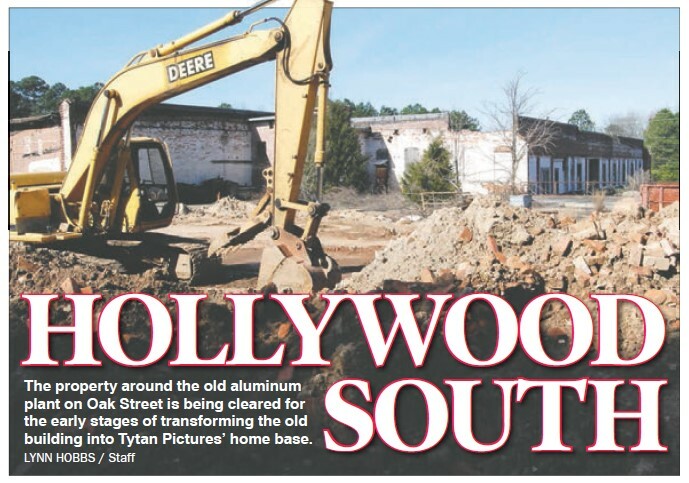 Almost a year has passed since Eatonton Downtown Development Authority leased the old Putnam State Prison to Tytan Pictures, and much has been happening behind the scenes, Tytan CEO Jim Stone said recently. The company, which specializes in cinematography and film production, recently secured the rights to produce at least two feature films – one on the life story of Major League Baseball great Darrell Strawberry, and the other on a World War II squadron of women bomber pilots. In addition to their own films, Tytan is serving as a host for other film producers to make their movies in Eatonton. When the lease was approved in March 2016, plans were already in the works for a movie called “King Seed” to begin filming this past fall at the aluminum plant and the prison. That obviously has not happened yet because it still is in the fundraising/development stage, Producer Victor Pisano told The Messenger. “The (presidential) election messed us up because people were sitting on their wallets and it put the economy on hold,” Stone explained of the holdup. Hurricane Matthew also put a damper on relocating Tytan Pictures from Savannah/Tybee Island to Eatonton because their property there was flooded. Just as rain, sleet or snow cannot stop the U.S. Postal Service, it seems tight wallets and hurricanes have not stopped the Tytan team from realizing their dream in Eatonton. They shot a music video, “Tan Lines and Moonshine,” exclusively here using all local actors. It was released in December 2016 and sent to Country Music Television. They have given tours of the prison several times to interested filmmakers, and one of those returned for a second look. Renovations are under way at the warden’s house beside the prison to turn it into a break area for actors between scenes. The prison will remain as is, because each movie producer will transform it into whatever he or she wants it to look like, Stone said. Tytan is setting up shop at the old aluminum plant on Oak Street. An old warehouse there now is in the process of being changed into a sound stage. 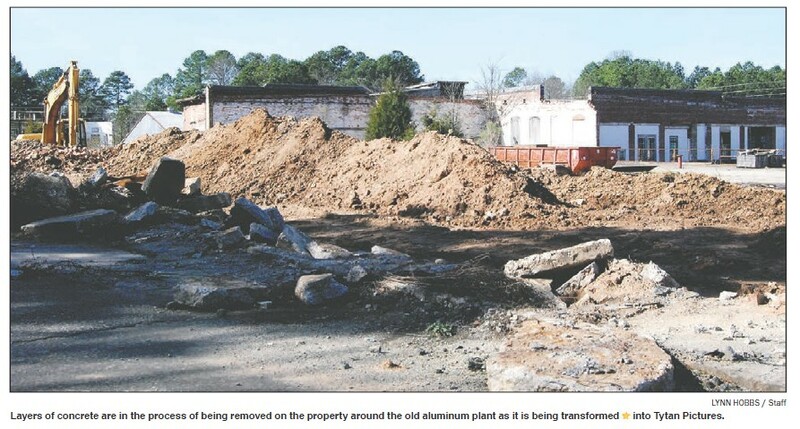 Rocker did not yet have an estimated completion date of the aluminum plant renovations. He said after they finish clearing it out, it will have to be surveyed before the designing stage can begin. The Tytans also are in the process of fulfilling the requirements of their lease with the DDA. The lease provides Tytan the option to purchase the prison within 10 years, not with money, but by providing $401,600 worth of specifically-detailed marketing and branding services for the City of Eatonton. 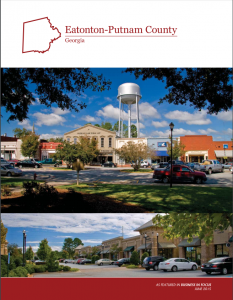 The agreement requires Tytan to design a branding campaign on Eatonton’s new identity as a film-ready, film-friendly town. Stone said they created a package and gave it to the Eatonton-Putnam Chamber of Commerce. Chamber President Roddie Anne Blackwell said the “Reach for the Stars” logo was made into the city’s 30th and final Christmas ornament, which was sold in December 2016 at the E-P Chamber office. “The logo pictures a young boy climbing a film reel to reach for a cluster of stars,” the COC’s notice about the ornament said in December. “This imagery is symbolic of the community’s growth and efforts to innovate.” Another requirement was to “create a 22-minute documentary on the history and future of Eatonton for online and broadcast uses.” Stone said the documentary is being written and is expected to be filmed in February. “Scott Jacobs (co-owner of Tytan with Stone) is working a lot on the branding. We are working on everything in the lease. And Darryl Strawberry will have a huge impact here. We expect to film at least two movies here this year,” Stone said.